The veins in my temple were throbbing more as we entered the building. As I explored the interiors, the searing pain was becoming more unbearable. This headache started while exploring the Laperal House, but I was hell-bent on demystifying this so-called "haunted" place. The interesting-ness of former Diplomat Hotel came to the fore only when this was abandoned after it was razed by fire in 1987. Honestly, this was my first time to enter the compound. This used to be a hotel when I was still a college student in Baguio City and known to be a residence of Tony Agpaoa, the faith healer. It was a private place, so there was no chance to visit it during my days in the City of Pines. Only after the death of Agpaoa that ghost stories came out. Stories narrated about headless apparitions of black and white images at night. When it was still operating, the employees and guests also claimed that they have been hearing strange sounds. Residents around the area recounted stories about hearing the banging of doors and windows, dishes clattering, and screaming in the middle of the night. Urban legend has it that these strange and ghostly phenomena are those of its former occupants as well as the terminally ill patients of Agpaoa. Before it was bought by Agpaoa, it was owned by Americans who settled in Baguio City in the early 1900s until the Dominican priests built a vacation house on the top of this hill in 1911, thus the name Dominican Hill. What made it more convincingly scary was the fact that it was not spared from the shelling by the Japanese Army Liberation Forces. Baguio City's history would tell that refugees fleeing from the Japanese soldiers took refuge inside the vacation house, only to become victims of Baguio bombing. This brought a lot of damage to the building, that a reconstruction was an option. The reconstruction was finished in 1948. Accounts also tell that nuns and priests were also beheaded during the war that it was believed to be the reason for headless apparitions. Now, it is called "The Baguio Dominican Heritage Hill and Nature Park". At the time of my visit, it was undergoing major renovations and reconstruction. It is now supposed to be a restaurant/ coffee shop and a venue for events like wedding receptions, baptisms, and conferences. Despite the presence of mortals in its hallowed halls and chambers--some students rehearsing for what seemed like a stage theater play, and us, travel bloggers--I found the place very, very lonely. At noontime, it was sunny but chilly and was very inviting for some quiet "me-time"! But this feeling of loneliness did not escape me. The wind hummed and leaves and pine needles rustled in harmony with this feeling of loneliness. This feeling crept inside that made my head throbbed more until it was no longer bearable that I had to get out to focus instead on the exteriors--and take some fresh air. While I felt better outside, the dense feeling did not spare me. The gardens are as lonely as the interiors--not because of the near absence of people in the place. Occasional murmurs and laughter filled the place and mixed with the gentle humming of the wind and rustling of pine needles, but still, loneliness enveloped the building and its surroundings. Be that as it may, I still find the place beautiful. 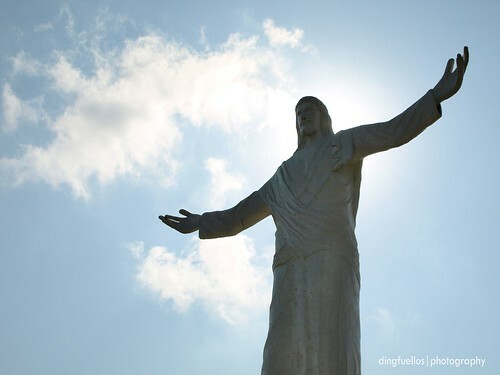 It is the highest point within Baguio City (aside, of course, from the nearby Mount Cabuyao in Tuba, Benguet), that one can literally enjoy a 360-degree view of the city. I can't say if there are ghosts in this place. I just find it lonely, that's all. By the way, my headache was not brought by any supernatural cause. I just lacked sleep, felt physically drained, and suffering from fatigue due to long hauls. A paracetamol tablet cured it. [Smile!]. If I have more chances to visit again, I would visit this place for some quiet time...over a cup of coffee. Wanna join? Diplomat Hotel was a subject of an indie film with the same title that starred by Gretchen Barreto. I haven't seen it yet but from the trailers it definitely banks on the scary stories that surrounds the hotel. 'Wished to watched it too as I find it interesting. But I want to visit this sight too and Baguio and experience if the scares are really true. Perhaps this place would be alive again if they contineously develop it tourists.